Canare Star Quad Mic/Line cable, handcrafted with super flexible Canare L-4E6S cable and superior Canare RCA audio connectors. Starquad for DRAMATICALLY reduced hum and EMI, and NO handling noise. Perfect to interconnect any unbalanced RCA input/outputs, on any Audio Gear. 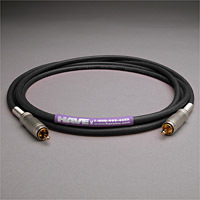 Also great for connecting recording equipment to distribution amplifiers, and when used in PAIRS, great for HOME THEATER analog audio applications. Shield DC Resistance: <9.1 ohms/1000 ft.